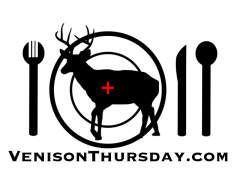 Deer Hunting = Locally grown, free range, hormone and antibiotic free meat. While I enjoy some pan fried venison liver and onions, I also like variety. And if that variety involves sandwiches of some sort, well, sign me up! 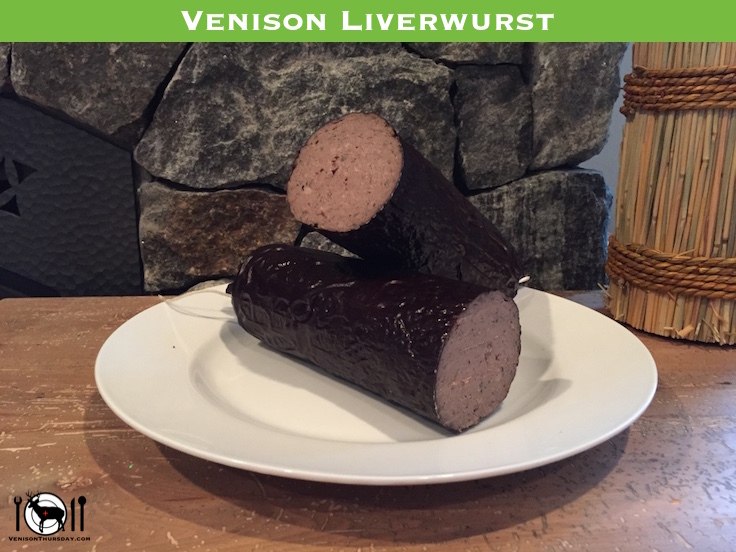 This recipe for homemade venison liverwurst may not be for everyone, but it does hit the mark when comparing it to a commercially made liverwurst. 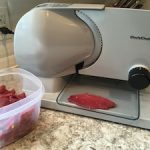 This is one of the messiest venison recipes I make. It’s not messy in that your kitchen will look like a bomb went off, but you will essentially be making a meat paste. Wear some disposable gloves and have extras. And keep a spatula handy for scraping out bowls. While this is not a complicated recipe by any means, making it will be a challenge if you don’t have some specialized tools. You’ll want a meat grinder, a food processor, and a sausage stuffer. To get the right consistency, the meat needs to be processed multiple times. If you have a food processor, but no grinder, you can get by as long as you buy some ground pork to start with. If you have a grinder but no food processor, you could grind several times with a fine blade, but the pastier this gets, the harder it is to put through the grinder. As for the sausage stuffer, I recommend a stand alone compression style stuffer. Personally, I use a LEM 5 lb vertical stuffer. The gears are all metal (beware, some stuffers come with plastic gears), and 5 lbs is the perfect size for me. I avoid making any batches of sausage more than ten pounds – that’s just my personal limit. There’s only so much sausage I’ll eat in a given year. And when I run out, I can always make more. I usually stay closer to five pounds for any one recipe I do, and this recipe falls under that. If you don’t have a dedicated sausage stuffer, but have a jerky gun, that would work in a pinch. Stuffing the paste in the small chamber will be a pain, but you can work with it. 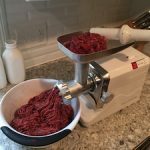 If you only have a grinder attachment sausage stuffer, you can use that as well, but because the paste gets more challenging to grind, trying to run it through the worm gear of the grinder stuffer will be just as challenging. Well, you know we’re using the liver. You’ll want to do some soaking on it after you dress the deer, like I laid out here. Making liverwurst is not one of my top priorities when I get home with a deer, I like to save it for a boring winter day, so I’ll use frozen liver. When I freeze the liver, I freeze it in approximately 1/3 pound packages of strips sliced to about 1/4 inch thick. Venison liverwurst breakfast sandwich on a homemade english muffin. I will usually start with a whole pork shoulder, so I’ll cut it all up into cubes and run it through the grinder once. Then I’ll take my pound and a half from that. Put it in a bowl with the diced liver and all the other ingredients, and mix thoroughly. Run this mixture through the grinder one more time with a fine blade. It isn’t pretty. Tell the faint of heart to look away should they wander into the kitchen. Chill for about 30 minutes or so. As the mixture warms, it gets harder to work with. Plus this lets the flavors infuse for a little while. Taking one third to one half of the mixture at a time, run it through the food processor till it get’s a nice creamy texture. The whole batch may fit in your processor, but most likely it will be too much all at once for your processor to handle smoothly. Pour/scrape it from the processor right into the sausage stuffer and stir it all together. Change your gloves. Probably for the fifth time. From here on in, it’ll be cleaner, I promise. Well, till you need to wash everything that is..
Stuff the mixture into a 2 1/2 inch casing of your choice. 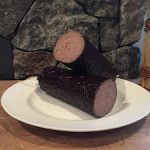 I always have mahogany casings on hand for summer sausage, and they work great for liverwurst too. The 20″ x 2 1/2″ will hold close to 3 lbs of meat, so this batch should fit perfectly in one casing. Tie off the end tightly enough to keep good form, but keep in mind you’ll need to jam a thermometer in there to check the temperature as it cooks. 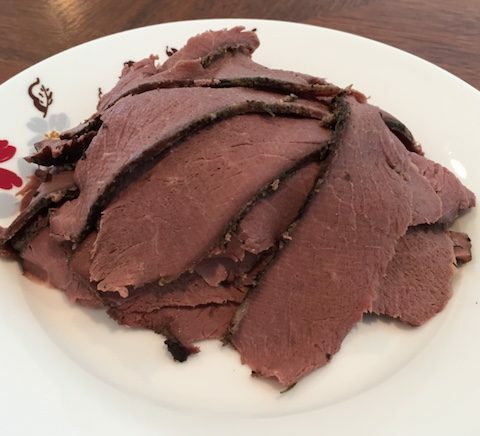 In a pan or pot big enough to hold the stuffed casing (I use a roasting pan, it’s the perfect length, and since it’s oblong, there isn’t a lot of excess water), poach the liverwurst till the internal temperature reaches 160. You want to keep the water from boiling. Make it barely simmer and you should be good. It will take about an hour for the meat to hit 160, but that of course will vary depending on how you manage the simmer.